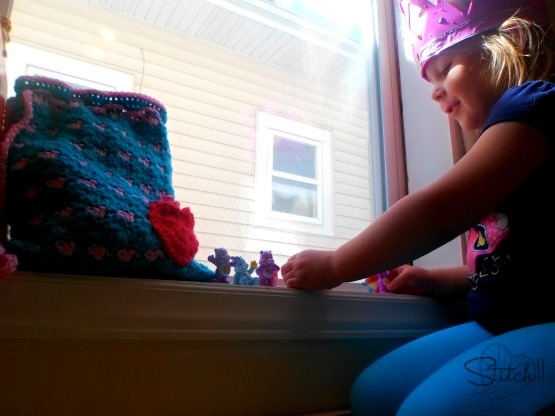 I am so excited- my daughter loves Care Bears as much as I did when I was her age…. and even loves watching the same movie over and over that I used to torture my older sisters with! This pattern was inspired by my daughters imagination. About a month ago, she started playing with invisible Care Bears. Every time we would leave the house, she would make sure that my husband and I put all the (pretend) Care Bears in our pockets. If we told her there wasn’t room in our pockets, she would put on her invisible backpack and ask us to help her put the bears in it. Ever since the bears arrived at my house, my daughter has been playing with them all day-every day….”You wanna play Care-A-Lot” is the every 5 minute question. 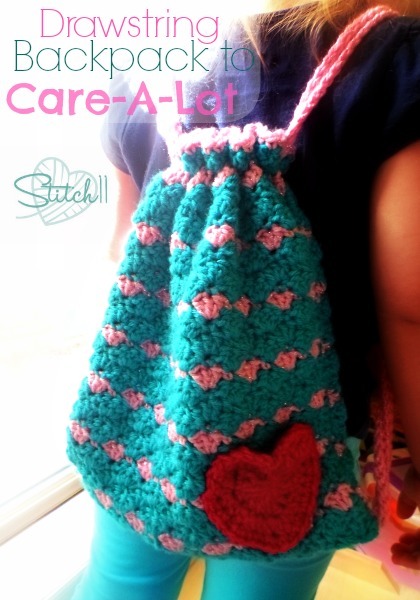 But, she still needed a backpack 🙂 So here it is, a free crochet pattern for the Drawstring Backpack to Care-A-Lot. I hope someone you know will get as much enjoyment out of this as my daughter. Row 1: CH 36. Skip 1 CH. SC into next CH. Skip 1 CH. ** 3 DC into next CH. Skip 1 CH. SC into next CH. Skip 1 CH. Repeat from ** 7 more times. 2 DC into last CH. CH 1, Turn. Row 2: SC into same stitch. **Skip 1 stitch. 3 DC into next stitch. Skip 1 stitch. SC into next stitch. Repeat from ** 7 more times. Skip next stitch. 2 DC into last stitch. CH 1, Turn. Repeat row 2 until you have a total of 28 rows. I used a fun sparkly pink every 4th row. Weave in your ends and repeat. (If you do not have an easy, clean, and secure technique for weaving in your ends, check out this tutorial by Fiber Flux. Place the two pieces together. I made it so the front of the pink stripes were both facing in. After you attach the two, you will flip it right side out, and the pretty side of the stripes will be on the outside. There are lots of ways you can attach the two pieces together. In the past, I have preferred joining pieces with a simple Single Crochet or the slip stitch. This time I chose to use my yarn needle and the blue/green yarn. You will only be joining the sides and bottom of the pieces, leaving the top open. If you want to use the yarn needle, but have no experience with hand sewing, check out this Hand Sewing Guide by Sewing It Up! After flipping the bag right side out, Join the yarn to a stitch at the top of the backpack. I used the blue-green yarn. I changed to pink yarn now. From here on out, use the 6 mm hook. CH 150. Skip one CH. Slip stitch back down the chain. Finish off leaving long tail and repeat. Starting on one side of the bag, Weave one of the straps all the way around the DC row. I wove mine after every 4 stitches. Take the other strap and do the same from the other side of the bag. With your yarn ends, Attach the ends of the straps through the bottom corners of the bag. 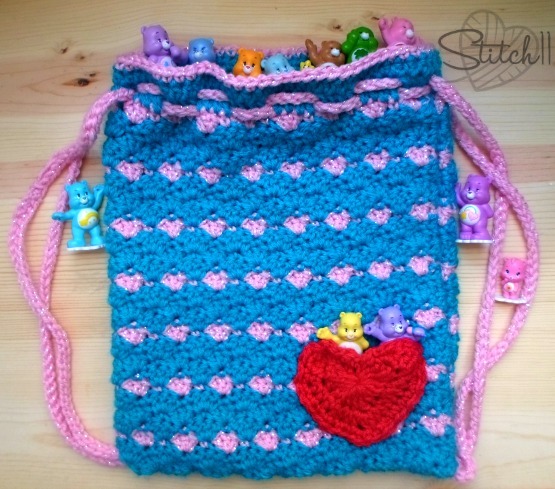 You will want to use your yarn needle and pull the ends through to the other side, then weave your ends in on the inside of the bag while securing both ends of each strap into the corners. I used the large free Love Heart pattern designed by PlanetJune. Attached it to the corner of the back pack. Do not attach the top of the heart. If you do not want it to be a pocket, you can attach it the entire way around. This is just adorable and loved reading your blog about it!! I might just have to make my grandaughter one soon.. She’s only 2 1/2, but she would use it for her Dora stuff she has.. 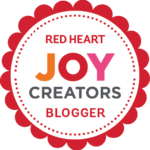 Thanks for sharing your free patterns and your talent with all of us crocheters!! Blessings Corina.. I love this story!!! I found a green Care Bear like this at a Salvation Army store….took a lot of digging in the toy pile…and have it as part of our St. Patrick’s Day mantel display…I didn’t realize these were so hard to find….the photo of your daughter reminds me of when my youngest son used to line his Hot Wheels up on the window ledge and play for hours…and ask me to joing every five too…lol…thanks for sharing this! how big is this bag? I am making it and it seems small for a backpack. It is smaller than a backpack people use for school. This is more for younger kids to use for toys and sleep overs. It is about a foot tall and 10 inches wide. Really you could adjust it to any size, just when you make the straps, try to make them long enough to go across the top and down the side of the bag.